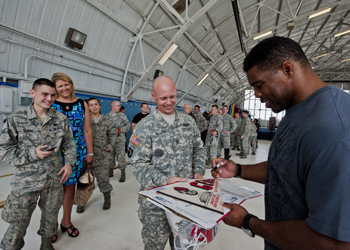 This slipped through the cracks last week: Herschel Walker made an appearance at Eglin Air Force Base, Fla., sharing stories of his battle with mental illness and winning a legion of Air Force fans along the way. The 1982 Heisman Trophy winner and legendary running back says he’s made stops at numerous military bases in an effort to encourage troops to not shy away from addressing mental health problems. “Look at me. We all fall short in life,” he said. A Pensacola (Fla.) News Journal report notes Walker received “multiple standing ovations” during an address inside an Eglin hangar. Click here to read Bill Verona’s enrapturing report from the Walker appearance.